I decided to use dulux paints for my dollhouse. 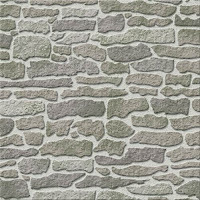 So, I went to their site to see what colours co-ordinate the stone paper already on the basement of the Manor. At dulux I also found a fun feature that helps you visualize your project. Perfect for modern settings and mixing colours on walls, ceilings etc. My Local store also sells the little sample bottles, so you don't have to go and purchase the giant 2.5L products. The exterior is going to be either Cornflower White or Just Walnut with accents of white for the windows and doors. I plan to add sand to the paint to make it look like the walls at our real house. I think its called pebble-dash finish.